Good morning and happy Monday! Thank you for welcoming the start of a brand new week with us here at the show! Every weekday, we strive to #HelpOurCommunity by bringing on Professionals, Entrepreneurs, Talents, and people that #HelpOurCity to showcase what it is they do for the Tampa Bay Area! From Business to Show Business, if you’d like to come on the #MorningAir, then head to http://www.tampabayradio.com and fill out the contact form! Or, feel free to email christian@tampabayradio.com! Today on #ThatBusinessShow with Jamie Meloni, we invited on Michaelangelo Mortellaro and Daniel Fabrizi as well as our Co – Host, Stella Guidicelli! Michaelangelo Mortellaro is co-founder with Gina Sinadinos of Mortellaro & Sinadinos, PLLC.! 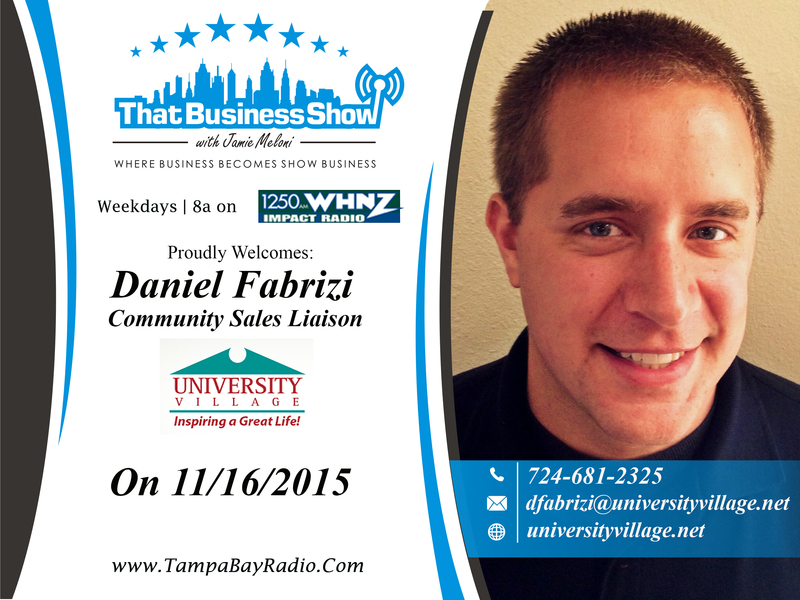 Daniel Fabrizi is the Community Sales Liaison for University Village! Having a bit of a moment to discuss the tragedy that occurred in Paris, France earlier this week, Stella, our Co – Host, reassured our listeners that her family was safe, and pushed for unity among Americans, asserting togetherness over division in the wake of the attacks. As the families grieve, our prayers and good hopes are with them! If you missed today’s episode of #ThatBusinessShow, then head to http://www.tampabayradio.com to listen to the show on demand! Or head to Jamie’s YouTube Channel at http://www.youtube.com/jamiemeloni! Coming on first on the #MorningAir bright and early this Monday morning was Daniel Fabrizi is the Community Sales Liaison for University Village. In charge of everything from all outside sales and marketing for the community as well as the liaison between the community and the local hospitals and other senior living communities, Daniel really helps the University Village community! Discussing with the listeners what makes University Village different from any other Senior Living Communities, Daniel also gave us some great information on what to consider when seeking out assisted living communities for our own families. Taking into account meals, entertainment, quality of life, and many more complex aspects, Daniel is confident in telling our listeners that University Village is the best option for your loved one! So make sure to check Daniel Fabrizi and The University Village Senior Living Communtiy, head to http://www.universityvillage.net! Our last guest on the show was Michaelangelo Mortellaro. 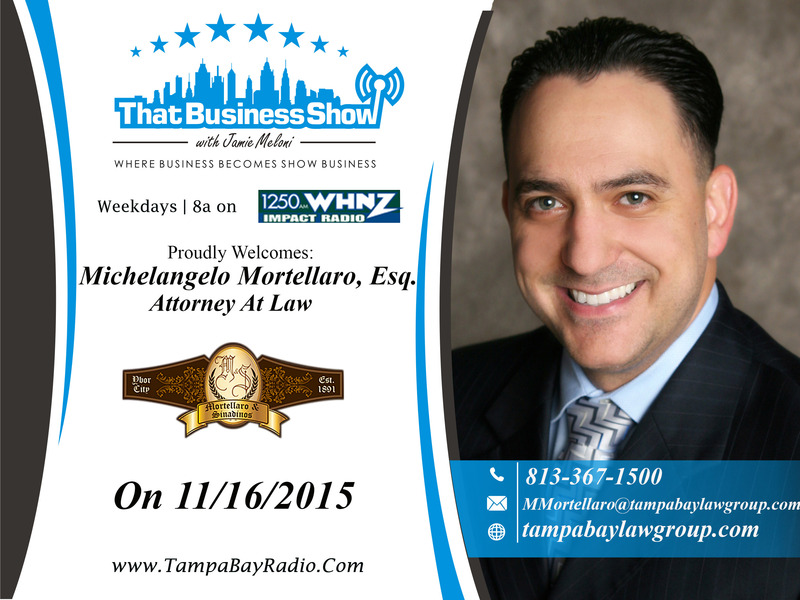 Michaelangelo Mortellaro is co-founder with Gina Sinadinos of Mortellaro & Sinadinos, PLLC. Today on the show, Michaelangelo discussed the All-Important – Will and Last Testament. Assuring our listeners that getting your will written and finalized while you’re healthy and young is the best course of action. To find out more and listen to his segment, head to http://www.tampabayradio.com! And to find out more about Michaelangelo, head to http://www.tampabaylawgroup.com! This entry was posted in Articles, Business, Entrepreneurship and Business, Work and tagged business, radio, showbusiness, talk. Bookmark the permalink.